Thalys was cool. I wandered in to Paris’ Gare du Nord station hall and began looking for a phone card. I noticed that not only were all the signs in French, but that all anyone spoke was French, unlike the Netherlands, where nearly everyone knew English. I recalled Stefi’s lament that French, Italians, and Spanish all sucked because they never spoke English. This might seem a queer complaint for a German to make, but I’ve noticed that in my travels, English is the common language in which us travellers negotiate our way through foreign countries and customs, whether we are German, Brazilian, Japanese, or American, Canadian, or British. Next, I noticed a booth that sold phone cards. I negotiated for the cheap one with my fingers, and was approached by an old bum who reeked of liquor. He seemed to want to take my change, hold my bags, take my phone card, and in the end contented himself by lightly brushing my buttock as I turned to walk away. I gave him a brief parting glance that expressed, “you have definately crossed the line and entered the realm in which you may be subjected to public embarassment or violence.” I thought that he was a magnificently offensive introduction to France, and I couldn’t help but sympathize with him a bit; Drunk bum in a train station, lonely for whatever it is that drunk bums in train stations get lonely for. Was it affection, or a desperately clumsy attempt for my wallet, which I don’t keep in my back pocket. I next acquired a carnet, which is a book of ten €1.20 metro tickets for €9, and took the metro to Le Fouconnier hostel, which was this unexpectedly pretty castle in the middle of Paris. My room was down several dark hallways on the third floor, and was extremely pleasant, very clean. It ran me near €25 for the €21 room and the €2.50 membership card, as they’re not affiliated with HI. They only allowed guests under thirty years of age, and the place was crawling with many a young’n. I ducked out to enjoy my first French cuisine, which was the Bouef Plat du Jour atop fried rice at a Chinese place. The meal came in under €6 with a Coke, and tasted pretty good. I set out towards the nearby Bastille, in search of a night club, but all the ones I could find opened at 11PM and cost €15. Given the Fouconnier’s 1AM curfew, I couldn’t justify it. The night was spent in the company of two Japanese boys, one with a cool, punky look, and the other gaunt, pale, and subdued. Both were pretty quiet, occasionally speaking with each other in comfortable Japanese. Our fourth roommate was allegedly a Belgian, though none of us ever saw him awake. The next morning was a baguette buffet, with butter, jams, orange juice, and a tasty café au lait. I sat across from an American who asked if I spoke English, then told me about a wonderful, cheap hostel in Normandy. That’s my short list for aprés Paris. I thought I’d try my luck at a cheaper HI hostel. The highly-reccommended, centrally-located, Auberge Jules Ferry was full. I found myself at the allegedly decent, slightly distant, but with plentiful facilities warehouse of a hostel Auberge Le D’Artagnan instead. You can’t check in until 3PM, so I had to add €2 to store my bag, to my €19.50-with-HI-membership bill. No curfew. The showers on our floor were broken. Later that evening, I went a floor up and found a working shower with a clogged drain that filled the floor basin with water. The shower stall door hitches were all busted. I’ll have to find another place tomorrow. Perhaps I’ll head back to the castle. Down at the metro station, I saw signs in French about some equipment anciens that was being exhibited this weekend, from what I could tell, to promote a future transit museum. I didn’t read the station quite right the first time I saw this sign, and so I couldn’t find the destination. Instead, I just wandered around the Tour Eiffel, snapping some pictures. Back at the metro, I saw another sign for the transit museum crowd, and made my way over to Port D’Ivry, where they had parked a handful of old equipment right in the middle of the metro station. Superb! There were signs in French, with interesting pictures, and staff explaining any number of fascinating things, in French. I found some model train geeks, and after some miscommunication as to the nature of Samedi, which I thought was Saturday, which it actually is, I found myself on a lovely ride on the RER to the suburb of La Varenne Chennevieres. At my destination, there was nowhere to supplement the downtown ticket from the carnet, so I followed another’s example and hopped the turnstile to leave. Outside, I saw a ticket window and tried to set things right. After all, I’d seen a video camera watching the turnstiles. I was lectured that I was supposed to take care of the ticket business downtown, and that at this point, it really doesn’t matter. The model railroad club was locked, because they do their open house on Samedi, and this was Dimanche, le jour aprés. I chilled out by the fountain, sharing some of my Dutch graham crackers with the local pigeons. Usually, when you feed a group of pigeons in this manner, you soon notice the one with the missing or lame foot. They always carry themselves well, and I always try to make sure they get some extra food. Sometimes you can tell that they understand that they are special. Today my friend with the lame foot would hover in front of me, flashing his colorful crest as if he were a hummingbird, and then perch off to my side, awaiting his chunk of graham cracker. I wandered in to what seemed a reasonably-priced, trendily chill restaurant, and was quickly seated by a friendly, efficient waiter, who not only spoke English but seemed to tolerate my French. I dropped €5.65 on a salami baguette and a vin rouge, which left me feeling quite good and amenable to a creme brule, which brought the bill to €10.25. It was worth it. Back at the AJ D’Artagnan, I entered the six-digit code to get in to my room, and found four beds, one of them occupied by a guitarist, napping in a white undershirt, and the aroma of wet towels. The available pay phone at D’Artagnan was broken, so I just hopped on the metro back to check out Fouconnier in person. They were booked solid for the next two nights, sorry, but you ought to do okay at MIJE, 4 Rue Teton, just a few metro stops away, here’s a metro map, on which I mark the stations for you. MIJE is an independant hostel. There were about eight beds spread around my room, which was either locked or not by the key available at reception. I dropped off my stuff, since the lockout ran ’til 5PM, and ran off to the Louvre, ducking in a side entrance, where there were no lines for tickets. Yay. And some of the cute girls. Around 2 or 3PM I wandered outside and shared my loaf of raisin bread with a few pigeons, particularly the one with the missing foot who throughly understood that I was feeding him, and that my stomping foot was for the others. He sat between my legs, snatching the crumbs that I had. I hadn’t even noticed his affliction at first, he just sat where he figured he belonged, having become accustomed to the social contract that people must have about feeding hurt pigeons. The conquering hero! Arc du Triomphe, Paris. I saw the Arc du Triomphe in the distance, and got it in my mind that I ought to ask around for a library, as this might be the source of cheap, useful computing resources. That wasn’t easy, given my communicative abilities in a tourist zone. I was instead accosted by a short Korean schoolteacher who wanted a touring companion. We wandered up the Seine to the Champs Elysée, taking pictures of the Arc du Triomphe, while I learned to slow my speech to help us converse in our limited English. I joined her in visiting Notre Dame, and we sat together through a mass, relaxing and building up an appetite. She explained how she couldn’t take communion without first confessing her sins. I explained my appreciation in visiting Notre Dame with a Catholic. We shared dinner near my hostel. I splurged on what in the end was pretty much an all-meat affair. I supposed that I could use the protein. Kyeong Hae gave me much of her meat, some of her frites, and disposed of the other half of her lunch’s chocolate chip cookie in my gullet. We arranged to meet the next morning at Musée D’Orsay. Nearly adjacent to the hostel was a bar that had a bunch of computers in the back. Real computers, not kiosks, which apparently were sometimes used for gaming, and were sufficient to get me on the Internet with SSH. The posted rate was €5 per hour, but there was no formal timing. I dropped €4 on my way out, after wresting a few e-mails from the bizarro French keyboard, and the guy said that yes, I could bring my laptop in. The MIJE was something of a dive: no security and eight of us to a room. The bathroom facilities seemed adequate, and I saw them mopping the floor. I liked it, though, because it is in an unassuming French neighborhood, pretty quiet despite the 2AM curfew. The canteen downstairs has all the quiet informality of a dorm, with young Japanese chatting on and on. D’Artagnan had felt more like a bad frat party. Today is a good day. The MIJE is a dump. The shower at least had a changing area, but no bench, and the shower head sprayed all over. I layed my money belt in my pants, and hung those from the hook on the door, over which I draped my towel, to keep my important clothes dry. After a baguette breakfast, meted out by a surly immigrant, I discovered that my bunk neighbor was planning to hit Musée D’Orsay, just as I was. He was also, like my new companion for the same destination, Korean. We ran over to Kyeong Hae’s metro stop, but we were a half hour late, and she wasn’t there. At the museum, she explained that she assumed that she had missed the boat, herself being fifteen minutes late. Kyeong Hae and I stood in line together for forty-five minutes, while our comrade had the €30 Paris museum pass, and didn’t need to stand in line to purchase tickets. Dining at a cafe in the attic of an old train station, next to a giant clock! Magnifique! The most extravagant room I have ever dined in. The Musée D’Orsay was fantabulous. I dug the Realist and Impressionist paintings, found some furniture, checked out a model of a part of Paris, some models of a theatre. It wasn’t long in to my visit that Kyeong Hae and I lost track of each other, never to meet again. The museum is located in a former train station and the conversion left lots of airy open spaces that are themselves worthy of admiration. In one corner they displayed some windows and house fixtures designed by Frank Lloyd Wright, with a model of the Robie House. I saw no mention of the real thing being in Chicago. I had been thinking to grab an inexpensive, filling lunch at McDonald’s but instead succumbed to the smell from the fancy restaurant inside the museum. Le menu du jour, avec un vin blanc, and €21, I was feeling pretty darned fine. Sometimes you just have to swallow your budget and shell out for something new and different, however extravagent. donate a bit for bird food. After the Orsay, I wandered towards a bridge over the Seine, where I saw sunlight to warm me on a cool day. From there, I was heading back towards the Louvre, near which I saw an old guy sitting on a bench, surrounded by birds. The chickadees sat in neat little rows on either side of him, waiting their turn to join the party in his cupped hands, where he had bread. Occasionally he would toss a handful to either side of the bench to appease his avian congregants. At his feet, pigeons scrounged for leftovers, and tourists like me took pictures. I sat a little while and admired the scene. A lady approached and lamented that it was a pity that she had no camera, for this was worth photography! I explained that I’d already snapped several pictures. Being, as she was, an Argentine, our conversation took place in a mixture of French, Spanish, and English. She explained that since the devaluation, Argentina was a splendidly inexpensive tourist destination, and that it should be my next place for vacation, where I could also find work in computers, or teaching English. We exchanged contact information, so I could share my bird man pictures with her, or find help exploring Argentina. Since the Orsay took so much time, it was now afternoon. All things considered, I was sufficiently satisfied with MIJE, who locked our luggage away by keeping the rooms closed all day, that I decided to add a day to my stay in Paris. I decided on a liesurely stroll back towards the hostel, where I could then proceed to while away many hours in transcribing the past weeks’ journal entries into a digital format, and thence upload them at the nice little Internet place nearby. I stumbled in to this gargantuan shopping complex, which seems to stretch underground forever, broken up by fountains and arching white support beams that hold glass for the sun to shine through. I bought a tart, and a €15 bath towel as I’d left my other towel at the Fouconnier. I sat down in a sunny spot, next to a Chinese university student who is apparently on exchange. We exchanged a few words in our common foreign language, which she was studying, as I ate my tart, and wrote more in the paper journal. I got back to MIJE, pulled out the laptop, and began transcribing the paper journal. Time-consuming. I got a few entries down, leaving the electronic version five days behind the paper, and went and sat in a smoky French bar, surrounded by Backgammon players. I downed an expensive €5 ham and cheese (jambon et fromage) baguette, and spent another €9 for some time hitting the Internet from the comfort of my very own workstation with its sober, American keyboard. Tomorrow, the Science and Industry museum, perhaps the Belgian gardens, and maybe some more Information Technology work, off to Normandy on Thurday. On my way to bed, I had a conversation, in Spanish, with a young Japanese girl, Naomi, who is studying Spanish in Spain. Crazy crazy girl, crazy crazy fun. Dig! Cite de la Science et l’Industre, Paris. Our body is a complex ecosystem comprised of specialized organs that behave according to their own advantage, with no greater concern for the whole. White blood cells have no opinion about disease, except that it is good to eat. Human organization, like ecosystems, is an amalgamation of seperate entities with differing agendae. Governments, corporations, and other organizations, like brains, attempt to organize the free agents towards a conscious goal. It would be interesting, for modern fiction, to see a world in which at the levels of body, human world, and natural ecosystem, are played out at each level, as something for the protagonist to deal with. Douglas Adams’ work comes to mind, or perhaps William Gibson’s _Neuromancer_, where the protagonist must work against other consciousnesses, some of which have set up his own body against him. On my way to the Metro this morning, I ran in to Naomi again. She was on her way back to Spain. We made good-bye with the Latin kiss on alternate cheeks, which Nagi had surprised me with when I saw her off at Amsterdam. This time I understood what was happening, and reciprocted. It was tricky, considering that vast difference in height, but in my opinion, this is one awesome way to say goodbye. While in America we see the occasional crazy Muslim trying to threaten random lives, Arabs see autocratic regimes propped up in nations like Saudi Arabia, and people starving as the indirect result of sanctions against Iraq, the frustrations of a dozen Arab nations with American foreign policy, which seeks to divide and conquer a downtrodden corner of the world, to ensure in this backwards “stability” a steady flow of oil. I lamented the fact that we failed to finish the war in Iraq, leaving instead this ugly detente of a stalemate. Arabs see hungry Arab children on TV. Americans will not soon forget the desperation of people jumping from the higher floors of the World Trade Center. Detente. I described an emerging concept of America as the reluctant World Empire, that ought to outsource her burden by promoting the growth of regional powers, that can ensure a self-interested stability in remote parts of the world. But today we retain the bloody corpse of Iraq, to keep Iran at bay. America has an abundance of everything it needs to enjoy its tendancy for isolationism. An abundance of everything except oil. I believe the practical course is to promote democracy in the Middle East. If Iran lets the people vote, let them have some influence in the region. It is in the self-interest of a stable regional power to ensure the steady flow of cash-producing exports. Another problem is the rising abundance of young people who lack opportunity. The paradox is that as we make it harder for Arabs to pursue opportunities in America, we leave more frustrated young men amenable to the poison of fundamentalist reactionaries. It was heartening that here we were, two such young people, with the opportunity to travel, encounter, and better understand each other. And all that was expressed somewhere between my limited French vocabulary, and his limited English vocabulary, with the occasional Spanish. Wow. Un jour de tranquiller. After reading about Normandy, tomorrow I am off to Bayeaux. I wasn’t comfortable taking too many pictures of the deceased, so this pile of femurs is all you get. 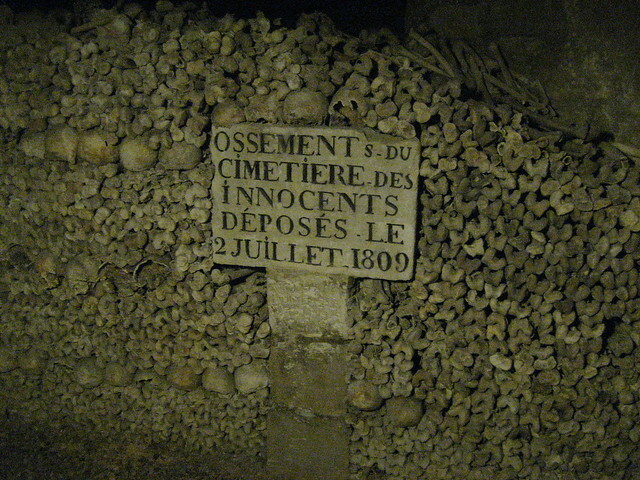 Long story short, Paris has had a lot of people buried in it, and every so often they needed to clear old cemeteries–often the mass graves of the very poorest people–and store the bones underground in retired quarries. It was a grim job that was eventually turned in to a spectacle, because once you’ve shuffled hundreds of thousands of femurs you have a lighter perspective on the whole life-death cycle. The modern catacombs aren’t so garish as they once were. All the same, there’s a cop waiting at the end to reclaim “souvenirs” inappropriately retrieved by tourists.